It occurred to me while watching professional trick skiing over the holiday break, “How in the world does someone learn how to do this?” Sure, I’ve skied before, but my journey from the top of the bunny slope to the bottom seems so far removed from the exploits of one of these people flying through the air aboard a couple of pieces of wood…it just seems like something people shouldn’t be able to do. Some people feel this way about investment. About half of Americans don’t invest at all. There are many reasons for this, but the most fundamental are fear and lack of training. In fact, those two traits are two sides of the same coin. Training and/or education is how people learn to do anything that they do. It’s how you get knowledge. Knowledge it’s power, it’s the fuel of action. Once you understand the basic tenets of investment, investment doesn’t seem so scary. Sure, there’s no guarantee that the money you invest won’t decrease or disappear, but rather than let this possibility keep you from ever beginning, your knowledge allows you to make a calculated risk. 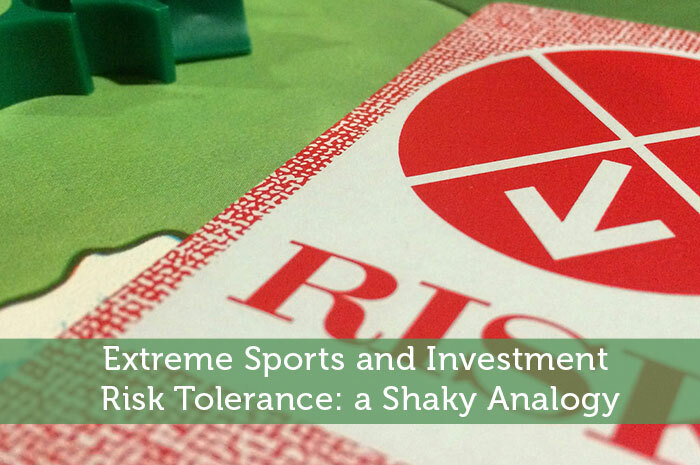 Risk is inherent to investment, and so, to a certain extent, is fear. I’m guessing the same is true for the young athletes who whizz through cold-looking landscapes on my television screen. They probably feel anxiety before they start hurling themselves down a cliff face. But because they’ve educated themselves on the workings of their own bodies, and the properties of their equipment on various sets of environmental conditions, this fear is able to be controlled. They are able to achieve great, glorious action. And sometimes, they crash. The same is true for investment. But like professional skiers, it’s the rare great investor who goes down and stays down, though this does happen from time to time. What’s important is learning the skills which minimize failure, and which allow for recovery when a failure inevitably occurs. If you can’t accept the possibility of temporary failure, you will neither invest nor ski. It’s this thinking that doesn’t allow me to mimic the recommendations of the web’s most conservative investment writers. Many of these folks tell new investors to take the most cautious approach to investment possible. While this is well and good for some, it’s not the kind of thing that will allow for spectacular results. I’m one who thinks that new investors are smart and talented enough to handle more risk, by accepting the responsibility of education and preparation. It’s this philosophy that can help today’s investors broaden their horizons, to include novel investment methods like binary options and Forex, as well as tried and true methods like mutual funds and ETFs. Without education and skill, the former will be more likely to fail. But by preparing (taking advantage of a free tutorial account from a reputable broker) new investors will find that these investment options have the most potential for immediate growth just about anywhere you can find. This is about the closest thing in the investment world that I can think of to extreme sports. It’s a shaky analogy at best, but I hope it hits home. Take your investment strategy off the bunny slopes and start to develop into something more risky (and a lot more rewarding).